I have just finished reading Cooking in Provence, by Alex Mackay and again, as is always the case, the book is over flowing with post it notes, highlighting all the recipes that I want to cook. This week so far I am cooking all Italian recipes from Light of Lucia, next week its all Greek recipes from My Greek Family Table and I am sure recipes from Cooking in Provence will be the following week and I will post any recipes that I feel deserve a spot on my blog, but today I have been baking all day. I have made brownies, ricarelli and baklava to take into work tomorrow, as it is an office tradition that when it is your birthday you have to supply the cakes. Seems a bit mean really, I’m sure the Boss should supply the cakes!!! But hey, I just hope they enjoy them. Anyway while I was spending so much time in the kitchen I thought I would prepare the orange zest that so many of the recipes in the above book require. Getting a head of the game and prepared is always my style, plus its worth the effort for the amazing aroma that is wafting through the house. 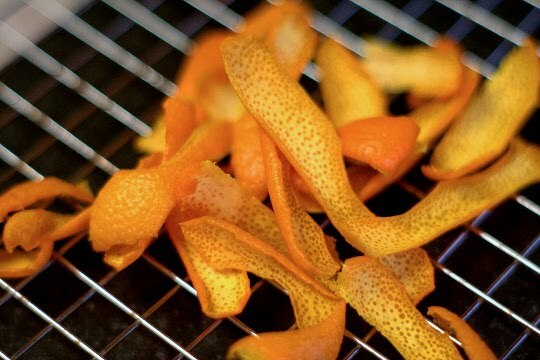 Remove the zest but not pith of 5 – 6 large oranges in long strips using a vegetable peeler. Scatter the zest strips in a single layer on either a non-stick tray or a cake rack over a tray. Place in the preheated oven and leave for 6 hours or overnight, until they are dry enough to snap in your fingers. Allow to cool, then store in a sealed jar or an airtight box. They will keep for virtually forever and will look amazing on the side in my kitchen. It will add a lovely Provencal fragrance to my cooking and I can’t wait to use it.